Have you been enjoying the cute Spring creations you've seen for the Peachy Keen Stamps & Miss Kate Cuttables Co-Hop Event? If you haven't, then you're in for a treat! It started yesterday and will go through Friday of this week. There are some amazing prizes being given away for this event and I'll share all the details about that at the bottom of this post, but first, let's get to the cute and crafty stuff!! Here's the card I created using Miss Kate Cuttables SVG files and Peachy Keen Stamps. For creating this, I used the Tulips SVG File from Miss Kate Cuttables. I used scraps of card stock for the various colors, and stamped these adorable little faces using the PK-1300 Sweet & Innocent Face Assortment. I like to add shading to projects like this, using my Copic markers and matching the marker color up to the card stock. It just gives that little pop of dimension or a 3-D effect that finishes it off. It's all about the details!! One detail that is SO important (at least to me) when using PKS faces is the white for the eyes. It make a HUGE difference in how the finished product looks and it's done, simply with a white gel pen. My favorite white gel pen is a White Gelly Roll pen and can be found at the SUPER REASONABLE price of $1.69 in the Peachy Keen Stamps Store!! I've used a multitude of white gel pens over the years, but these are ever faithful. They have a medium/fine tip for filling in the smallest of eyes, and I've never had one of these pens clog to date. Yep! It's my fav! The "punny" Plant one on me! sentiment comes from the PKSC-16 April 2013 Stamp of the Month stamp set, which just so happens to be on sale as one of the sale items in the PKS Store. I ♥ that stamp set!! I think that about does it for me, but be sure to stop by the Peachy Keen Stamps and Miss Kate Cuttables Blogs where you'll see projects from the rest of today's team. Prize Info for our co-sponsored event can be found below!! Prizes :: Prizes :: Prizes!! GRAND PRIZE by Peachy Keen Stamps is a $75.00 Gift Certificate to one lucky person who follows the hop each day, comments on each blog post, and Follows each designer blog. Don’t miss any days in the commenting and following to be sure to be in the drawing for this awesome prize! 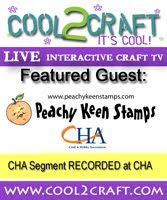 Be sure to LIKE Miss Kate Cuttables and Peachy Keen Stamps on Facebook too! Would you like an additional chance to win the GRAND PRIZE? Be a member of our Group on Facebook (The Peachy Place), and if you’re not a member, ask to join and we’ll give you an additional entry into the grand prize drawing! The complete list of PKS winners will be posted on the PKS Blog on Monday, April 21st. Be sure to check back and see if you're one of those LUCKY winners!! EACH DAY Miss Kate Cuttables is giving away a file to EVERYONE who comments and Follows on the Design Teams’ hop post. Be sure to comment on THIS post and FOLLOW my blog!! GRAND PRIZE by Miss Kate Cuttables is a $25.00 Gift Certificate to someone who hops with us each day this week by commenting and following each blog on the hop. Don’t miss any days in the commenting and following to be sure to be in the drawing for this awesome prize! How about an additional chance to win the Miss Kate Cuttables GRAND PRIZE? Be a member of our Miss Kate Cuttables Galleria Group on Facebook and we’ll give you an additional chance to win the grand prize! Thanks for stopping by today! Have a wonderful day and happy stamping!! So cute!I love tulips. Great details! This card is TOO CUTE Lorie!!! Your tulips look like they were fresh cut and those faces are just adorable! Beautiful card! I agree the white for the eyes is HUGE. And I love the added little bling you placed in the center of each tulip. Lovely card. Lorie I am a new follower and I just love your card. Thanks for sharing. I love this card. The tulips "pop" off the page. Super cute, love the faces on the flowers. Sweet card, love the flower faces. Your card is beautiful. I love the fun faces and the pearls. What a nice touch. Thanks for the hints on making things pop on the card! Another fabulous creation Lori! Love the sweet PKS faces you used on this adorable Tulips and the colors you chose! Wow, just beautiful, thanks for sharing your adorable card, I am a new follower! I love the faces on these tulips they are adorable. Love, love the faces as petals. Thanks for sharing! Love your card! Very creative! What a sweet card! I love the happy colors. Such a beautiful card! Adorable tulips! Love their smiles!! Great colors used!! Love the added pearls on each one as well!! Super fun!! Very cute card. Love the bright colors. Thanks for the tip on using Copics for shading. I've always used my Cats Eyes so now can't wait to try my Copics as another option. Oh I just love your sweet, sweet card. Love the flowers and the faces are so sweet. Adorable!!! Like the flowers in Alice in Wonderland! Oh my -- so super cute!!! Love you work!!! it's so cute. The are the cutest tulips I have ever seen. Thanks so much. Cute card. Love all the details and the faces you chose for the flowers are just precious. Smiling tulips make me happy! I LOVE how you added the faces to your flowers. This is absolutely precious Lorie! Instantly it reminds me of the part in Alice in Wonderland where she encounters the flower garden and sings with all the flowers....little bread and butterflies kiss the tulips... :D These little sweeties look just like them with their darling, joyful faces! I agree, the white in the eyes is a MUST and you are a PKS pro so you should know! Thanks so much for your marvelous card and your wonderful post and for all you do to inspire me! Hugs and happy Sunday! Really adorable card a fun sentiment! And, you gotta love that sentiment! Thanks for the tip about the white pen. Love the little faces. Such a beautiful and cheerful card!! I absolutely love it!! Love your cute card! would like to see a video on how you put it together!! Your card is just so adorable! I love the faces on the tulips! Tulips are my favorite flower ... very cute card! The shading and whites of the eyes do make everything pop and look great. The Sweet & Innocent Faces look super on that great tulip cut. Great job! LORIE! All I can say is YOU ROCK! This card is AMAZING!! Those faces are perfect on those beautiful flowers! You blew my mind...AGAIN! This is fabulous! I love the tulips and the PK faces are perfect! This is just way too cute, love love love your card. I love the flowers. They look so happy. So adorable, love your blog! Lori, I love your tulips and oh so adorable expressions. I had no idea PKS sold white gel pens. Lol. I get so wrapped up drooling over all the face stamps. Great post write up. Hugs! Your card is adorable! So cute!! The peachy faces are just adorable and love the cheery colors ad Kate flower files. Oh my goodness, super super cute! Oh my goodness--I LOVE the tulips. PK face stamps just make everything so special. What a beautiful card (and love the punny sentiment!) Thanks for sharing! LOVE the faces on the tulips!!!! Tulips are my favorite and these are just too cute!! Love the tulips! thanks for the great tip too! These tulips are adorable. Love the faces and the sentiment. I'm a follower. Just discovered PK stamps and your blog today. Love the cute card created, so much fun!!! Oh Lorie...those flowers were the perfect choice for those cute faces. Love Them! Oh Lorie, This is soooo cute!! Love the flowers!! These are too too cute! New follower. These are just the cutest tulips, beautifully done!! Lorie I adore your tulip card! The perfect card for Spring! I'm so in love with this card. The tulips are completely adorable!! Super cute! Love the sweet faces.